Jacob Fred Jazz Odyssey's 27th release in 21 years, The Battle For Earth, is a mind melting, particle reorganizing trip through time and space. Manipulated loops, electronics, and synthesizers are juxtaposed with grand piano, guitar, and lap steel. Drummer Josh Raymer's meta-modern drum stylings push, pull and shake the foundation. 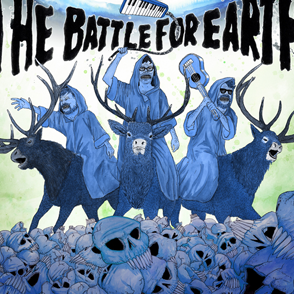 Recorded live at DazzleJazz in Denver, CO, The Battle For Earth finds JFJO planted firmly in their own language and mythology. Expanding on newer material from 2014's release, Worker, alongside classic tunes like "Tetherball Triumph" and "Sean's Song," the band's unique, angular arrangements and tonalities are redefined as they explore the sonic freedom the current lineup offers. Far from being a traditional trio, JFJO founder/keyboardist Brian Haas simultaneously plays Moog bass and grand piano, throwing in melodica and other synths while guitarist Chris Combs bounces between guitar, lap steel and various synthesizers, making the trio sound like a much larger ensemble. In addition to the ground breaking music, JFJO will be presenting and starring in it’s first ever, limited edition comic book also called The Battle For Earth (digital download included). Conceived by Combs and brought to life by artist Joe Cappa, the comic tells an original, amusing Sci-fi-jazz epic that is equal parts "Space Is The Place" and "Yellow Submarine". Flying elk, helpful aliens, evil space beasts, and lots of free-jazz-powered weaponry make TBFE an intriguing and unique piece of JFJO's 21+ year history. “Frankly, it's hard to think of a more original, fresh-sounding band."